We are delighted to announce that Women Writers Online will once again be free during the month of March, in celebration of Women’s History Month. This collection includes almost 400 texts written and translated by women, first published between 1526 and 1850. We also invite you to explore our other publications, which are always open access. These include Women Writers in Review (WWiR), a collection of close to 700 reviews of and responses to works by the works in WWO, and Women Writers in Context (WWiC), a collection of essays exploring topics related to early women’s writing. 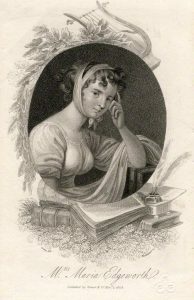 Portrait of Maria Edgeworth, 1808. Public Domain. Wikimedia Commons. If you haven’t visited Women Writers Online before, there are many different ways to find new texts. For instance, you can try filtering by genre or by publication year. The keyword search box is another good way to begin exploring. Or, you might want to go to WWiR or WWiC and browse the themes and topics there for subjects you’re interested in, since both collections link back to the texts in WWO. If you have worked with WWO in the past, you might want to see our recently published texts here. As another way to help people get started with WWO, we’ve included some of our favorite texts below. Would that, like the monster Briareus, I could strike a hundred blows in the same instant, and that all the vampers of romance, who merit annihilation, were in my presence!—they are the vermin of literature— their spawn creep to our fire-sides, and cover our tables, our chairs, our sofas and our mantle-pieces; we find them in the bed-chambers of our daughters; nay, not unfrequently are they placed beneath their pillows, to occupy their minds at day-break, or to beguile a sleepless night. To make little Apple paſties to fry.Take pared Apples and cut them into ſmall pieces to ſtew, ſtew them to papp with claret wine and ſpice, then put in a good piece of ſweet butter, cinnamon, ginger, roſe-water, ſugar and plumped currans; then put them into the puff-paſte and fry them, ſo ſerve them in with ſugar. Looking for a bit of true crime? We have two texts on a local murder case: Mary Carr Clarke’s play, Sarah Maria Cornell, or the Fall River Murder and Catherine Read Arnold’s history Fall River: An Authentic Narrative. Playwright Hannah Cowley answers the relationship questions you never knew you had—how to use cross-dressing to add a little spice to your life, how to manipulate your father into ordering you to marry the man of your dreams, how to get that man to want to marry you in the first place, and much more. Husband have a wandering eye? Victoria demonstrates how to dress like a man and seduce hubby’s mistress in A Bold Stroke for a Husband. If he won’t disguise himself as your dressmaker, it’s not true love. Just ask Elizabeth from Who’s the Dupe? Margaret Cavendish’s The Blazing World is sometimes called the first science fiction novel; it describes a woman’s journey, by way of the north pole, to a world with Fish-men, Bear-men, and Worm-men—among quite a few others. We also have many other works by Cavendish—including her plays, historical and scientific writings, and letters. If you’re looking for something inspirational, we have several of Elizabeth I’s speeches, including two versions of the Tilbury Speech, which was featured in one of our favorite Kate Beaton comics. 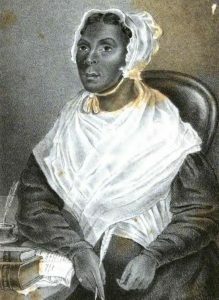 Portrait of Jarena Lee, 1849. Public Domain. Wikimedia Commons. If you’d like to read a memoir, there are quite a few in WWO, including several by and about women of color. We have: A Narrative of the Life and Travels of Mrs. Nancy Prince, The Life and Religious Experience of Jarena Lee, and the Memoir of Mrs. Chloe Spear. Please feel free to suggest your own favorite texts in the comments—and we hope you enjoy the collection! Hi, is there a link for signing up for the free access during March?